Who in Omaha, NE doesn’t spend almost ALL their Spring and Summer spare time outside? The weather is beautiful and with all the pool parties, BBQ’s, social gatherings and family get-togethers, you are sure to enjoy having a barbecue island, outdoor kitchen or fireplace for outdoor roasts! Having a beautiful patio or deck with an eating and entertaining area will not only increase your property value but it also adds square footage and allows you to enjoy all the wonderful memories that you wouldn’t have otherwise! An outdoor kitchen is a large, permanent structure that is ideally located close to a patio seating area. One of the great things about outdoor kitchens is that they can incorporate virtually every cooling element needed. They can include bbqs, stoves, refrigerators and even sinks. They reduce the need to go back and forth between your indoor kitchen and backyard and allow you to spend more time with your guests and party goers. Plus they allow you to cook while outside in the cool breeze and open space; there is no need to crank up the air while cooking in a stuffy kitchen. Your outdoor kitchen can be the second heart of your home. If you have a beautiful custom design dream for your outdoor living area, that is great! Omaha Landscape & Holiday Lighting Contractor can build it to order. And if you need some ideas to choose from for your outdoor living needs, that’s great too! We have an extensive portfolio and keep current with new technologies and trends. The sky is the limit when we are dreaming up your outdoor living space. We can create your custom outdoor living area with BBQ islands, fire pits, outdoor fireplaces, patios, decks and gazebos; all done with your décor, needs and time frame in mind. We can help you no matter what size area you have to work with or what budget you have to spend. We can build you a custom BBQ island or outdoor kitchen area out of many different materials; brick, stucco, block or stone; whatever you would like. Omaha Landscape can create something fantastic that will meet your outdoor living needs and leave your neighbors green with envy! If you want a gazebo, outdoor fire pit, fireplace or kitchen that fits the design of your home, then you are going to want to contact Omaha Landscape for an estimate immediately! Adding a barbeque island is more affordable than you might think and no Omaha home is complete without one! In no time your backyard will look like a resort and your friends will love your outdoor living area. Thanks for doing such a great job. My wife and I just love the new back yard and will recommend you to all our friends and family. 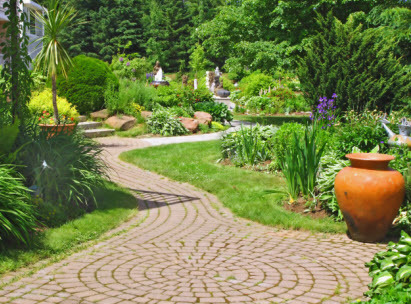 From small residential gardens to large commercial grounds, Omaha Landscaping & Holiday Lighting Contractor can meet all your landscape design needs from start to finish. 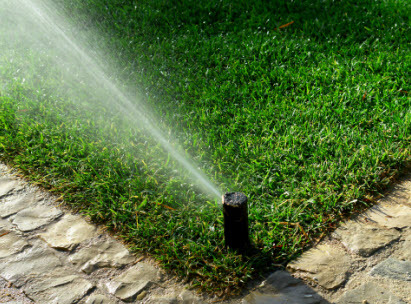 Regular lawn maintenance is vital for a beautiful and healthy lawn. Omana Landscaping & Holiday Lighting Contractor does it all! 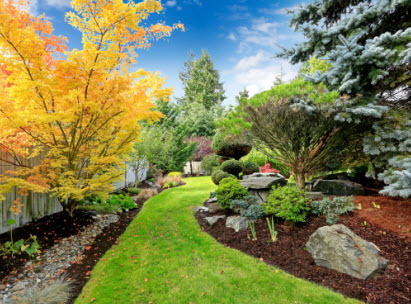 Call us for a lawn and yard your neighbors will envy! Omaha Landscaping & Holiday Lighting are available year round for all your exterior holiday and event lighting needs. From Christmas to weddings and other special occasions. Copyright © 2014 Omaha Landscaping Service. All rights reserved.